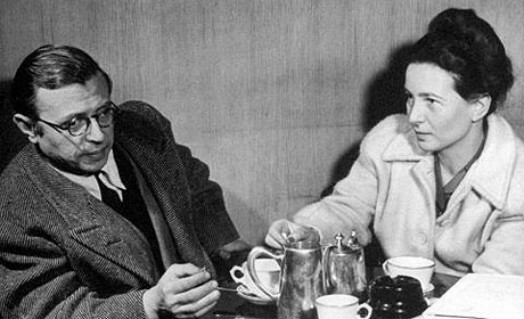 Determined from early ages to rebel against the bourgeois values they were raised with, Jean- Paul Sartre and Simone de Beauvoir never married: they agreed instead to a two-year, monogamous lease, which would end in amorous freedom but deepen in an open relationship of constant conversation and complete emotional honesty. In their voluminous correspondence, in their fiction and in their philosophical writings, they worked together to define a set of philosophical and aesthetic beliefs that idealized individual freedom, and they acted out their ideas by taking lovers whenever opportunities presented themselves. At first Sartre and Beauvoir shared single lovers in ‘trios,’ but after World War II they ceased to share their lovers, although they always encouraged each other to turn their affairs into philosophical explorations, and they consoled each other when their lovers did not fulfill them. Sartre and Beauvoir defined their identities more by writing than by their fulfillment in love, and if they took other long-term lovers—Sartre bought several of his lovers apartments, and still saw them regularly—if their relationship turned into a literary-philosophical partnership, they nonetheless put themselves in each other’s hands, each allowing the other to experiment with life, encouraging each other to write out their experiences and then to test their understanding on each other’s experience.